Cupcakes 'n Daisies: How About a Sew-Along? 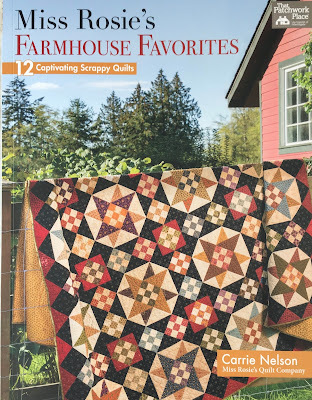 There's a new book out by Miss Rosie's Quilt Co., Miss Rosie's Farmhouse Favorites. It's a compilation of some of Carrie Nelson's favorite quilts. As luck would have it, they're my favorites too. The cover quilt is Birdseye, I made this quilt in 2011, it's Lifetime Quilt Number 77. (Link Here). I get my Birdseye out in the fall, but it's made with Civil War Reproduction fabric, I sure would like a new one, maybe made using some of Corey Yoder's cheery Sundrops fabric. The book has 12 patterns, and two of the patterns feature other MRQC patterns that I made. One is Three Barns, Lifetime Quilt Number 102 (link here) using French General fabric. I made this quilt back in 2013. When it's not on the farm being photographed with sheep it's in my office. I toyed around with changing up this pattern while I was piecing it but in the end stuck with the original pattern, a good call on my part. I still love those fussy cut medallion centers in the cornerstones. 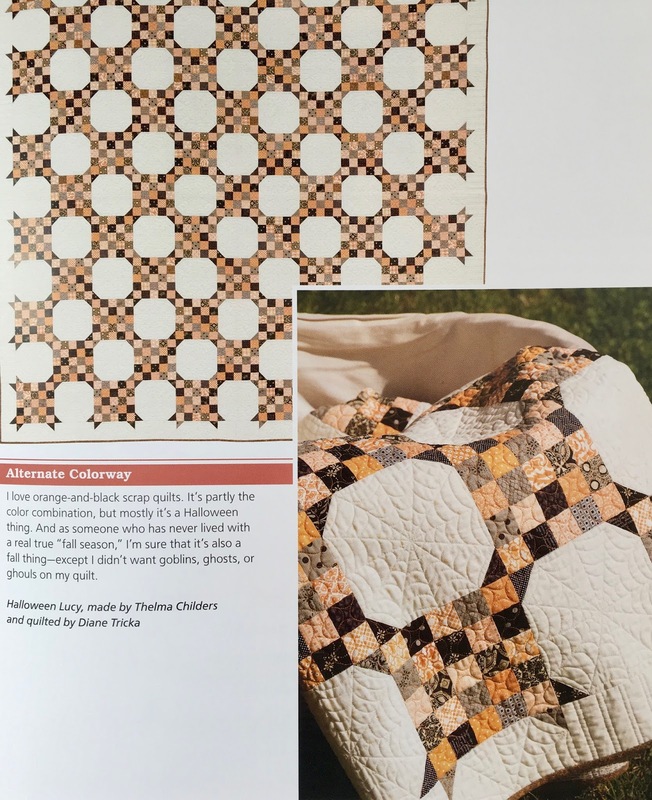 Lucy also made the book, Lifetime Quilt Number 142 (link here), which I made in the fall of 2014. I love the quilt, particularly the quilting, those cobwebs quilted in the center of those background blocks became the standard pattern for most of the Lucy quilts I've seen pieced. That quilt does not live with me, it has a wonderful and loving home in California, but I've already earmarked my calendar to make another one, for me, this fall. So of the 12 projects included in this book, I've only made 3, something I plan to remedy. I think first up for me will be Due South. This pattern has been on my To Do list for too long, but not for much longer. I think this Rifle Paper Company fabric would make an amazing Due South. Out of all of the Carrie favorites listed in this book I'm sure there is at least one pattern that's been on your To Do list for too long. Wouldn't you like to pick a pattern, some fabric, and sew along with me? To make it easier for one person to sew along, Carrie is providing a book for a giveaway. 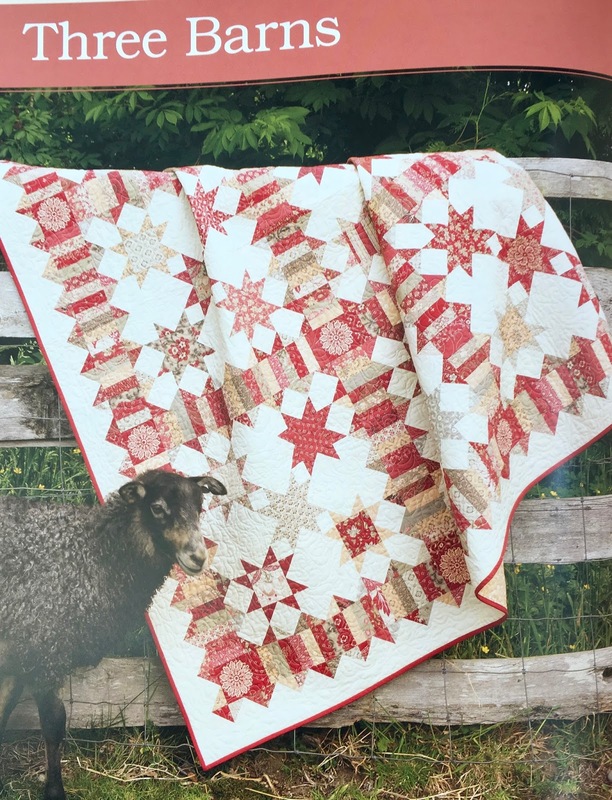 To enter leave a comment on this blog post with your favorite Miss Rosie's Quilt Co pattern, one you've made or dream of making. You have until end of day Friday, February 17th. I'll announce the winner next week. MRQC patterns are hard to come by these days, how nice to have a collection of them available again. A friend showed me her copy of the book and it is one I have to get! I loved how Carrie showed the old version of a quilt and then the new version of it in different fabrics. It sure is hard to pick just one favorite, but I am going with Birdseye. A few years ago I got the pattern for it, but haven't gotten it made yet. What a lovely book and I'm all in for a sew along! I've just rummaged through my stash and pulled out a William Morris fq oack, which I've been "saving" for the right quilt. Sometimes a quilt just resonates and Due South does just that. In June, 2014, I stepped onto American soil for the first time. (I'm from Australia.) I was only going to be here for a five week visit, to meet a wonderful guy I'd been talking with via messages and Skype for a year. Three months later we were married, we started the process of my becoming a US resident, followed by a quick trip back to Australia in 2015 to sell my house. Fast forward to now and we have just about finished gathering evidence for the second step in my residency, where my status will change from Conditional Permanent Resident to Permanent Resident by the end of April. This morning I've been gathering paperwork, lots of paperwork! All kinds of paperwork to use as evidence that we are legitimately married. You wouldn't think that gathering bank statements, insurance policies etc. would be emotional, would you? As I sort and file, it brings up all kinds of joyful memories of my new life here in the US. So, Due South is the perfect quilt for me to make, except I will have to tweak the name, just a little, to Due East, as that was the direction I travelled in to find my forever home. That's a pretty amazing story Sue! Congratulations on your romance and your new residency! This looks like a great quilt - I have a couple Schnibbles patterns and I have made one - Jacks - which I made because my son's name is Jack! This book looks fabulous. My favourite quilt would be the Three Barns, which is stunning. I used to really enjoy visiting Rosie's blog, and miss it. I love your idea of using that stack of Riffle Paper to make Due South! Love Lucy. Can't wait to get started. Seven Letters is my favorite! I made that quilt with Laundry Basket Quilts fabric and it turned out beautiful!! I love, love, love this book. Got mine last week at my local quilt shop. Plan on making several new MRQ's this year. I look forward to your sew along with those great fabrics. Some of my favorite Miss Rosie quilt patterns are Cracked Pots, Full House and Summer Wind. I own a couple other patterns that I am dying to make, but they are at home and I'm not. Grrrr. Maybe when I get home I can get one of them started. I'm very excited to see this book! I would make the Bird's Eye!! I need that book! 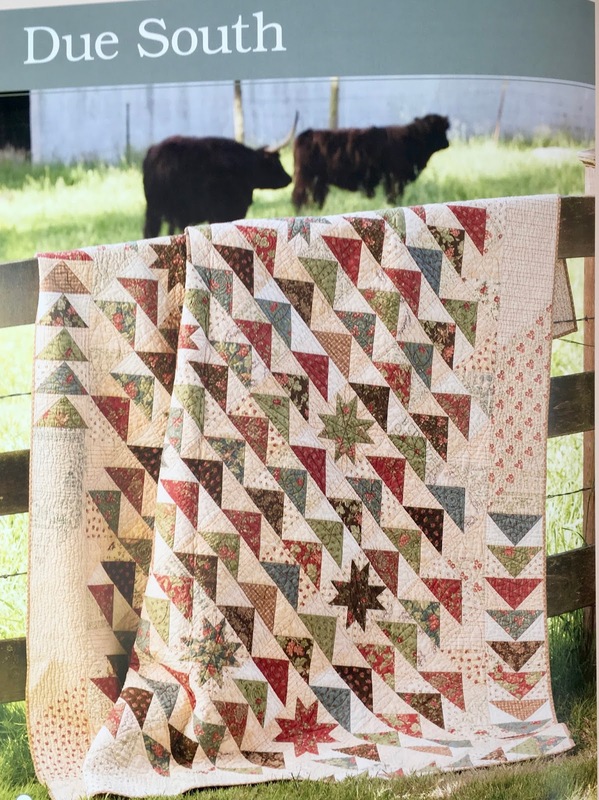 It's hard to pick a favorite,but the quilt on the cover Birdseye is one of my favorites in the book. Maybe I can sew along with you if I can get my ducks in a row! You know how unruly ducks (and life) can be. Love Miss Rosie. I love anything Carrie designs. I made Imagine out of a 3 Sisters bundle I had been hoarding for ages and it's one of my favorites. I just love Miss Rosie quilts. Need to select a pattern and begin. Thanks for the offer. I have two with Post-It Notes on them. Due South was the first one I marked. Thought it would be fitting with my LA to LA move, even though that move was more lateral than southerly. The second was Cracked Pots. Those houses just reminded me of the beautiful historic homes in my teeny town, and the story behind the name is certainly reflective of our community that I've come to know and love so much working at city hall. I never can keep up with sew-alongs but I think I might dive in on this one. Thanks for the inspiration, Thelma, and Carrie ... you rock! Love Miss Rosie and her quilts. I had the pleasure of being her chauffeur when she gave a presentation and taught a class at our guild a "few" years back. A wonderful person to hang out with!!! I love all the patterns. But I must say that Birdseye is a favorite of mine. I'm not sure you could go wrong with choosing any of them. Thanks for the opportunity! I've always wanted to make Three Barns, even though the name confuses me--lol! There are so many to choose from, but I would pick Birdseye first. I also like her Paris Texas quilt. Sadly it isn't in this book. Due South is at the top of my list yet Birdseye is just as gorgeous. Thank you for the chance to win the book! One of my favorites is Hook. I've made a Halloween wall hanging version that has to be my all time favorite for that holiday. Thanks for the chance to win this wonderful book. What a beautiful book. I am so wanting to make Cracked Pots. I love just about any quilt with a house in it. Miss Rosie did a fantastic job once again. Thanks for the chance to win. My first Rosie quilt was Crackers. My favorite that I have made may be Four Corners...which I made with more blocks to make it bigger. Birdseye and Due South are certainly calling me. I'm eager to get this book. The quilts and farm animals :-) are wonderful! Thank you for the sweet giveaway! I was going to say Jersey Girl, but after browsing your finishes, may change that to Full House (your Christmas in the City). Cannot say they are favorites though, I love all Miss Rosie and miss Rosie. Thanks for a chance at what looks like a great book. What beautiful quilts! I've never made a Miss Rosie pattern but after looking thru the quilts in this book, I see I've been remiss. I would love to make several starting with Raise The Roof! Thanks for the chance to win this book. I just saw this book at my local quilt shop. It is stunning and I loved the quilts pictured. When I first started making quilts after retiring as an elementary school librarian, I bought several Schnibble patterns. They were smaller and I enjoyed making every small quilt. It gave me confidence to move forward. I would love to sew along and I've always wanted to make Lucy. I'm in! I need the book though! Oh what a difficult choice to only pick one! I have made many of Carrie's Schnibble patterns, but nothing bigger. I think I would like to make a Due South out of bright scraps. Thanks for the chance and the sew along! I love Miss Rosie's patterns. I love them all, but I currently am anticipating making Short Line once I have mt WIPS under control!! Raise the Roof is one of my favorite quilts that I have made of Carrie's patterns. Mine was done in the colours of the Caribbean Sea! Would love to own this book and love Carries's patterns. I have always wanted to make "Lucy ". I love it in Halloween colors but I think I would do it in blues. Thank you for the chance to win and sew along! I'm starting on a Christmas Toulouse. Hopefully its done by next December. Oh you will love it - it's my favorite quilt ever! I have never made a Miss Rosie pattern, although I'm sure there's one buried in my sewing room that I couldn't decide on colors for, so it's gotten buried in the meantime. I am really drawn to the one you show above, 3 Barns, though. Such a wonderful giveaway and the book makes my heart race. It's so hard to pick a favorite pattern - all of them are wonderful, but I do love Three Barns so much!! I am a sucker for flying geese, so that Due South would likely be my first quilt from a Miss Rosie pattern. You did inspire me to get the pattern for the Village quilt, but it's patiently waiting its' turn. My very very favorite of hers is Toulouse. I made it in soft Christmas colors and it not only is it my favorite Miss Rosie quilt, it is my favorite quilt EVER. I'd love to win this book!! I also made every small Schnibble in her first Schnibble book. That was so much fun and I got to use fabrics that I never would have chosen otherwise! The Three Barns pattern is different & would be a great way to use some of my French General stash. I also like several patterns in her Spice of Life book like Elizabeth, Three Coins & Open Door. I'd make the Lucy quilt to do the neat spiderweb quilting! Birdseye is very pretty. I haven't made any MRQC quilts yet, but I'm a relative newbie. I have a few of her books and every time I look at them I have a new favorite. Settling on one would be impossible. I love this new book and it's on my wishlist but sadly neiterh amazon germany nor the bookdespository have it yet available. I made a few of Carrie's Schnibbles patterns for the Schnibbles parade and pick a favorite is really hard because I love them all. Looking forward to the sew-along when did you plan to start it? I love Miss Rosie patterns and would love to make Three Barns. I have this book in a couple of different online shopping carts at the moment. I plan to buy it for sure (if I don't win it!) and I love the cover quilt, but I will have to browse the book to decide for sure. Thanks for the giveaway! It's hard to choose (because I love all of her patterns), but I think Seven Letters might be my favourite. I really must get round to making it! Thanks for the giveaway! I would love to make any one of them. They are all amazing. I think the first one I would make is Due South. Flying geese and Stars - what's not to love. My all-time favourite pattern is Tag Sale and I made it as Carrie did from the 3 Sisters collection Paris Flea Market. That quilt goes on my bed every summer. I have dozens of Carrie's patterns and all her books and even though I probably have all the patterns in this book, I will still buy the book - in fact it is on order. How can you go wrong with Miss Rosie patterns? I have made and loved several of Carrie's quilts - Tag Sale, Plan C, Eventide, and most recently, Elizabeth. I doubt I could even count all the Schnibbles I've made. If I were to play along, I would make either Birds Eye or Lucy. Love Miss Rosie patterns. I read Carrie's Moda blog and enjoy it. I think that Due South would be perfect for those fabrics! Very cute way to use flying geese! Three Barns is my favorite! Cindy Lou Who has been on the wish list for soooo long but fabric choice and time have kept it there. I made Double Duty for DS2 21st birthday in Kansas Trouble fabrics and we both love it. I have not seen this book so from what is shown, Due South, is calling. I've been eyeing Wayne and Gordie, not sure about fabric choice though. I love Carrie Nelson's patterns. I got on a Scribbles kick a few years ago and have absolutely loved every single pattern. There are so many from the new book I want to make. I believe I would start with Opening Day or maybe Raise the Roof or Three Barns. So difficult to decide. Thanks for the giveaway opportunity. I love Miss Rosie's patterns and have made many, especially her Schnibbles patterns. I'd like to make Three Barns next! I'm dreaming of making almost every quilt in Schnibbles Times Two. Eventide is one that I always wanted to make. I love making Full House. Tak care! Lucy is the one I like the best, with the Halloween colors. I have had the pattern for Toulouse for probably 5 years. It is beautiful and someday . . .
Like some other commenters, I love the Toulouse pattern. I also love the one with the houses, Come On Over to My House I think it's called. This book looks like a winner! I can't get enough of those Schnibbles patterns, My house is surrounded with these gorgeous quilts. I love them all. This is an awesome giveaway. I like a lot of them but love Lucy and for some reason haven't made it yet!! Oooh. I'd love to make that Due South quilt. If I win the book, it will move to the top of my to do list. Thanks for the chance. I have my fabrics all ready for the Lucy quilt. Would love the book. Oh..it's Lucy for me! Definitely others in the book but first up would be Lucy!! Thank you for a chance at the giveaway!! I love all the quilts, but Lucy is wonderful. Thanks for a chance to win a book! So many great patterns. I am liking Village. Good charm pack or scrap buster. What a wonderful book. My favorite would be Three Barns. I DO have a Miss Rosie pattern I'm dying to make.....DUE SOUTH! I have the fabrics all pulled...and have had them pulled for I'd say 2 years . "must do" quilts keep getting in the way of "want to do" quilts. I'd love to win this book....Carrie's patterns are some of my favorite/go to patterns! It's funny you picked Due Sourh because that's my favorite also. For some unknown reason this book will not be available until the 28th April in France or the UK. It is waiting patiently on my "Wish list"! I have made a number of "Schnibbles" quilts and X rated is my favourite - so far! I really miss seeing the "Year of Schnibbles" quilt parades and so another quilt along with a Carrie quilt would be a lovely idea! Lynne. Great giveaway. I love her quilt patterns. I want to do the Due South. I have been wanting to do a flying guess quilt for some time now. Thanks, Nancy P.
Fun to see your Three Barns in Carrie's new book. It looks great with sheep ; ) Due South has been in my stack of "to make" patterns as well. It's fun seeing so many starting this quilt with wonderful fabric choices. I think I need to get on this sew-along wagon too! Thanks, Thelma, for the incentive! I just finished Come On A My House which I made a little larger, and can't decide what project to take on next... I love them all! Cracked Pots, Lucy, Wayne and Gordie, Due South are calling me. I'm a relatively new quilter and all of Carrie's patterns are new to me, and so much fun. Thanks for the inspiration, Thelma. Your work is very motivating to me. I love how you number your quilts. Thanks for the chance to win this book! Miss Rosie has so many great patterns it is hard to pick one. I just finished making OXO for a friend as a Xmas gift. Was quite pleased with the results, now I will have to make another for myself. One of these days I will have to make Three Barns. It catches my eye all the time. It seems like when I am working on a quilt it is always my favorite till I see another . I see Three Barns in my near future though. This looks like a great book, so many great patterns all in one. "Birdseye" is on my list. A sew-along would be just the motivation I need :) Thanks for the chance to win! Due South and Opening Day are on my must do list. I love all her patterns. I made Lucy because I fell in love with yours! I know another Miss Rosie quilt is in my future but what to choose? Oh my hard question, when you love them all. That is a great book... filled with old favorites! I would love to find a pattern and join the sew along! Oh, now to decide on which one! I love Harvey and Seven Letters. I love Eventide and Bird's Eye. I have made several of the Schnibbles patterns in the past. I love this new book and think it would inspire me to quilt again. Love Miss Rosie's style. Thanks for the chance to win this wonderful quilt book. Thelma, I LOVE all of Rosie's patterns! and have made quite a few, but I still keep eyeing the LUCY quilt, in those orange and blacks... my daughter-in-law would love it, I'm sure! Thank you so much for the inspiration of a sew-along, and for the opportunity to win a great book!! Happy Stitching! Three Barns is definitely on my list. I love Eventide too. They're just all so pretty. I've been waiting for book! Woo hoo! My favorite is the Lincoln schnibbles I made while back. It would be fun to make a larger one. I have made a few others and enjoyed them all. I just received this book in the mail yesterday!!! So many beautiful quilts! My favorite is Birdseye - I fell in love with it when I saw pictures of yours when you made it! This book is good news! Lucy has always attracted me! It's hard to decide, but Lucy looks just great to me!Beautiful quilts! I love Miss Rosie's quilt co patterns---I've made several and have several on my to do list. Tag Sale is on my bed right now so maybe it is my favorite? I have to make Lucy. That is my granddaughters name. I bought the book sight unseen just because it was a Miss Rosie book. I love Carrie's patterns and books. I have made several and want to make more. I need to push aside the UFO's I am working on and start a new quilt.